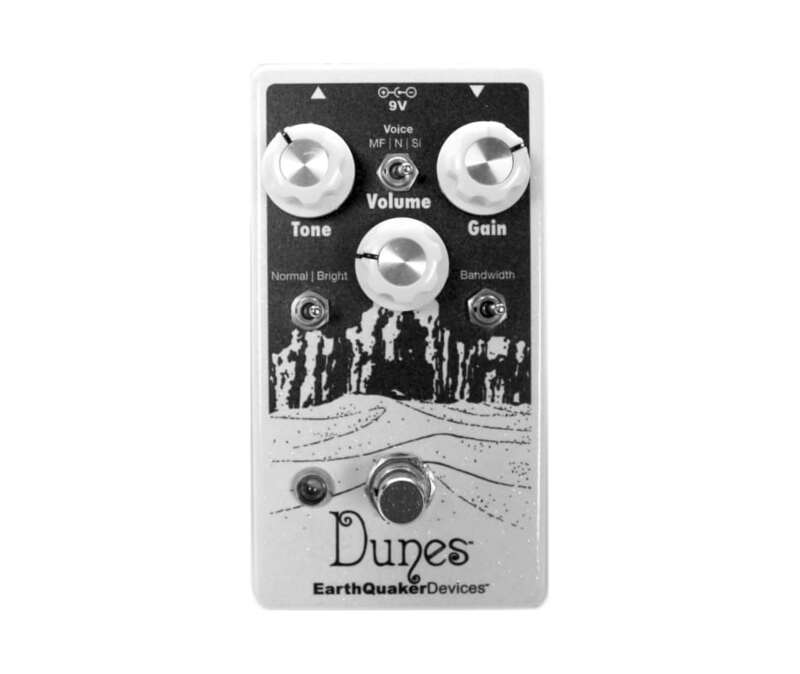 The Dunes is a condensed version of EarthQuaker's highly popular Palisades; a heavily featured take on the classic 808 overdrive. It features the same Gain, Tone and Level controls along with our favorite voice and bandwidth settings as well as the "Normal/Bright" toggle. The selectable voices are: "MOSFET" for a tight crunchy sound (Setting 3 on the Palisades), "Silicon" for the classic 808 sound (Setting 5 on the Palisades) and "None" which goes from clean boost to gritty, pure opamp distortion with a massive volume boost (Setting 1 on the Palisades). The two bandwidth settings are "stock" for the classic tone (Setting 3 on the Palisades) and "full range" for more low end (Setting 5 on the Palisades). The Dunes has all the great tone of the big boy Palisades but with a simplified interface and a smaller footprint!